There is no compromise when it comes to Safety Our commitment goes far beyond just the equipment. Our focus on Personal Safety, Process Safety, and Procedural Safety makes us a World Leader when it comes to making sure that our best work practices reduce injury, illness, and at-risk behaviors. The IMI Quality Management Program encompasses the most qualified people, using the right equipment and correct procedures to provide quality products and services. As an Industry Leader, our dedication to delivering a quality product to our clients is our number one commitment. There is no substitute for performing the job right the first time. Moral character and the virtues of Honesty, Respect, and Transparency are guiding principles when developing and maintaining client relationships. 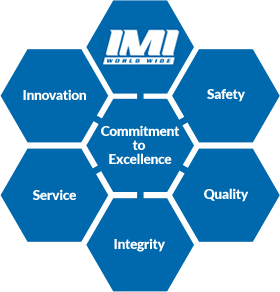 IMI is a full service, industrial contractor offering all the elements necessary to successfully undertake and complete your maintenance/construction project. Whether your job is grassroots construction, a small or large capital project, demolition, or a turnaround, IMI will perform safely, on budget and on time. IMI continues to make a strong investment to remain on the cutting edge of technology and current industrial practices. We pride ourselves on being an industrial leader through efficiency and sustainability.